The Greatest Comeback in the History of Irish Music. 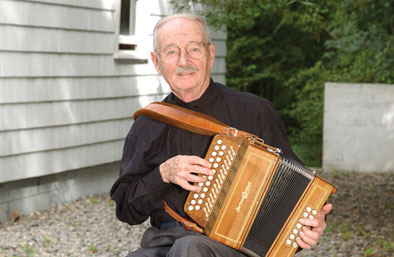 Boston-born accordion player Joe Derrane made several records in 1948 when he was only 16. They became legendary throughout the Irish music world. In the late 1950s Boston's Irish dance scene declined. Joe stopped playing the button accordion and switched to more commercial music. By the 1990s, Joe had given up playing altogether. In 1993, producer Paddy Noonan released Joe's recordings on CD. When music critic Earle Hitchner heard them, he called Noonan, and said, "This is really great playing. When did this guy die?" When he learned that Joe was still living, he convinced him to pick up the accordion again, after a 40-year hiatus. Joe Derrane's reemergence has been hailed by aficionados as the greatest comeback in the history of Irish music. Joe Derrane was awarded a NEA National Heritage Fellowship in 2004. In 2012, the MCC named Derrane an Artist Fellow in the Traditional Arts. Joe Derrane passed away on July 22, 2016.